it wasn’t on our way. but we steered there anyway. a red-lined triangle on the roadmap was all that it took. that and what turned into a few hours’ drive through the mountains, in the rain, with no shoulder to the right, and big trucks barreling by on the left. and there was that boy in the back seat, after all, the boy who’d learned all the words, who’d traced the story of the president who’d ended slavery, and who somehow had decided that to settle his own hard-thumping heart, he’d needed to slip the soles of his shoes into the very same spot on the crest of the hill in the midst of the half-circles of square white stones, unmarked graves, state-by-state in the somberest of roll calls, where the words first were bellowed over the stretched-out limbs of the forever-sleeping soldiers. it was the gettysburg address, three short paragraphs really, that he’d learned at school, read out loud in assembly, recited one night at dinner, delightfully reading “deducted” instead of “dedicated” each time he came to that particular mix of d’s and c’s and t’s that, after all, is so indistinguishable to an orator of a mere seven years. and so, since we were driving to washington anyway, he figured, why not swing up into pennsylvania, that breadloaf-shaped chunk in the jigsaw puzzle, not far from the d,c, triangle, and drive to the little town where the great speech was etched into the national memory. it wasn’t enough, on that chilly cold afternoon, to merely drive through the town, stand in some parking lot, marked visitor center, and rip out the sheet with the words. we stopped for a map, and directions. we wiggled our way through farm fields once soaked in blood. we parked near the crest of a hill, walked past long stone fences, crossed a country road, and walked and walked until we couldn’t get closer to where ol’ abe’s shoes must have fallen, stood firm against the hard cold soils that had seen and heard too much, and now at last were being laid to rest and peace and the broadcloth of history. the little boy, one who most of the time spouts numbers and news about ballfields and the players who play there, somehow had been transfixed by these words and this speech and this spot on the map. there was no steering him elsewhere. no approximation of history. he’d decided it had to be just as it was. 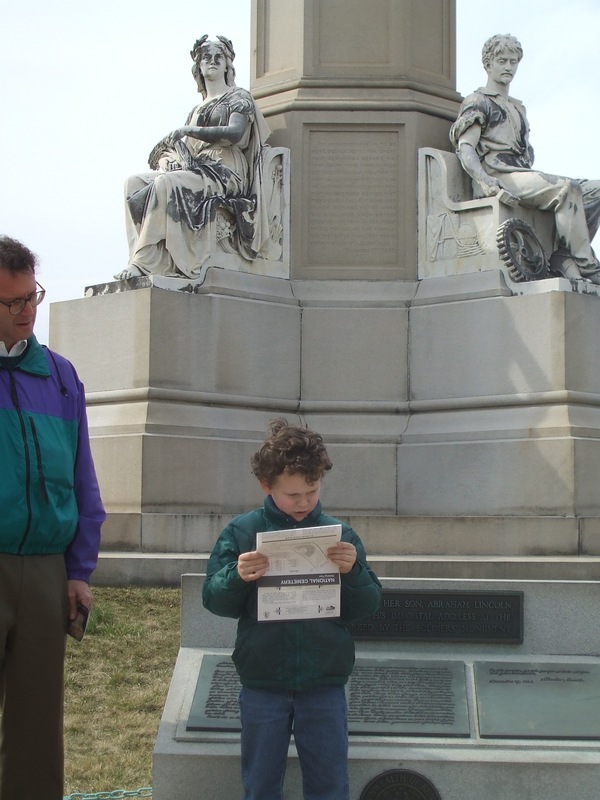 had to be him reading the words out loud, to the cold winds, and the three grownups (his big brother, after all, is nearly a grownup) who love him so very much, who stood somewhat astonished at this whole insistence on honoring history. he’d carried along a parchment, written in script, signed “Abraham Lincoln, November 19, 1863,” but he couldn’t make out the 19th-century swirls and dips and swoops of soot-black ink. so, when we’d stopped for the map, he’d handily gotten the words typed-out, more to his liking, more like the pages of books he now reads by the hour, this boy who not long ago struggled with words in any old form. so there we were at the top of the hill, just in front of the great marble monument, with the plaque marking the spot. the boy, seven and change, settled in, maybe as lincoln had; pulled the words from his pocket, unfolded the ridges, began. “four score,” he started, of course. and then carried on. the words coming in that familiar cadence and rhythm we all know, all of us who in some schoolroom somewhere pored over the civil war pages, tried our hand at memorizing, maybe for the very first time, with this particular passage. somewhere, though, near the part where lincoln wrote that “we can not dedicate, we can not consecrate, we can not hallow this ground,” the words slowed to nearly a halt. we looked in, each of us, zeroed our eyes on his face, trying to read the root of the slowed-down reading. only then, as the next few words sputtered, did i see what i thought looked like a tear. and then another and another. he was crying and reading, the boy who would not let the tears stop the cadence, the moment, not till the end when we all crushed him, a tangle of arms, cheeks, tears. “sweetheart what is it?” i asked, not sure if it was that the hard words had netted his courage, swallowed his sense of the moment, or whether it was the sad truth of the story, the soldiers buried in half moons and lines all around. “it’s the soldiers.” he managed to choke out in short few syllables, before burying his face in my sleeve. we all stood in this knot for a minute or two. i knew that i, for one, was etching the moment into my mind, into my picture of this boy who i’d birthed, this boy who not often was thought of as the one with his pulse in sync with the poetry of a world marred by bloodshed and tombstones. sometimes on a cold afternoon, at the crest of history, you discover the script that you’ve dotted and crossed in your head, the script of your very own child, it’s not what you thought it was. and you stand there, wiping back tears, his and your own. and all of a sudden you understand a whole new chapter’s been written. one you will never forget. nothing earth-shattering here. just a page in the scrapbook, titled “our road trip to washington,” it’s been a long long time since we went away for spring break. all the cats in the ‘hood bore a bit of a shock since over the years we’ve evolved into the de facto cat sitters. as always, it’s splendid to be home and back at the keyboard (and washing machine, and the checkout line at the grocery), but, of all years, this was a fine one to brush against the white house gate. criss-crossing the country we listened to obama on tape, both books, and to hear the depth of the man–and the wisdom he piles into but one clause of one sentence, let alone 10 hours of books-on-tape–well, it made the 1,500-some miles whiz by in what seemed like mere minutes. now, back to the laundry. shabbat had tiptoed in, as it always does, praise be to God who promised it. without fail, no matter what the week has washed up on our shores, shabbat graces our table, graces the earth, as the globe is shadowed in darkness, as sunlight goes out, and candles, one by one, house by house, city by city, flicker on. we’d lit our two candles, as always we do. we’d gobbled our fish, as the hand of the clock was sweeping toward half past the hour, and we’d not had plenty of time. prayers would begin any minute at the church, yes, where our synagogue dwells. the cantor would lift up a minor-key chord, the rabbi would open the book. and all of us, the few of us, gathered there would begin. only this friday night i wouldn’t be there. i knew, deep in the place that knows all these things, that a room with walls and a roof, even a room with windows taller and wider than i’ll ever be, it wasn’t big enough for my prayers. not this friday night. not at the close of this very long week. so, while the man who i love went to pray in that room, i went to the edge of the lake. 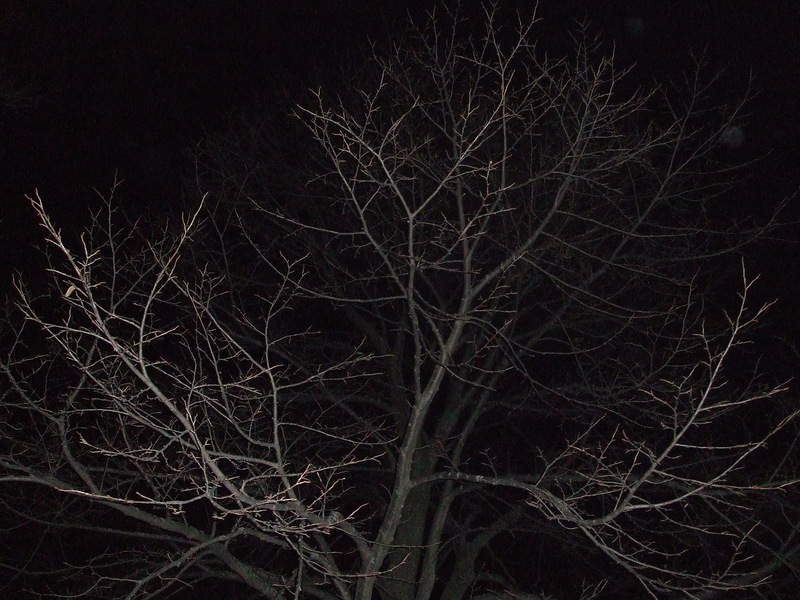 i went to where the trees reach into the night, finger the darkness. where the dome scrapes the edge of infinity. where no prayer is too big. i went to the place where, uncannily, eerily, that night, the lake made no sound. not a whimper of wave. nothing, but stillness. then, from out of the black, out of the dense deep thickness that is night at the beach, i heard the lone cry of a night-flying goose. i couldn’t make out its wings, couldn’t see a wisp of its shadow. all i know is i heard it, high overhead. calling, and crying, and breaking the night with a sorrowful mourning song, not unlike the one in my soul. i sat there, on the sand in the cold, looking up into the moonless night. not even the moon made itself known that dark night at the edge of the lake. somewhere, though, i knew, it was out there, the moon, round and white, absorbing, reflecting, the light of the number one star. but this night it wasn’t for me to see. not this night. nor the V-string of geese, heading for home, riding the wind, steering straight for the polestar. only the night-shattering cry, haunting, calling, sending chills down my bones. and so it passed on the moonless night at the beach. prayers spilling like waves that i couldn’t hear. floating out to the heavens that seemed to be cloaked wholly in blackness. fitting, i thought, as i sat there unfurling each and every petition. i couldn’t see God. couldn’t hear waves. couldn’t even make out the moon. but in none of those instances did my lack of sensation suggest absence of any kind, nor mean that nothing was there. just because i couldn’t hear flapping of wings, didn’t mean the geese were not flying. just because i couldn’t hear luffing of waves to the shore, didn’t mean the lake had gone dry. and so with the God whose moon was lost behind clouds. it all surrounded me, every last bit of creation. and, yes, too, creator. faith is the thing that comes to you when you kneel in the dark on the sand in the night. and the lone goose calls to you, tells you it’s there up above. wasn’t long, that dark night, till the first star crept out from the clouds. i never did see the moon. but, in time, i turned and headed for home. my prayers had poured out from me, filled up the night sky. branched far and wide beyond the limbs of the tree. skipped past the lone shining star. i headed for home, safe in the knowing that moon and rippling water were right where they needed to be. even though all around me was darkness. even though i couldn’t see but one step in front of me. prayer is like that sometimes. so is life, too. do you sometimes feel as if your prayers can’t be contained in a room, or even your heart? do they need to spill out on a canvas without any edges? where do you like to go when your prayers are so very big? it’s hardly a bothersome little bird, its wings outlined in blue, slate blue, really. its bill and its legs, etched in the same confederate blue. fitting, the civil war suggestion, for that ol’ hungry bird, a whole flock of them, actually, seems to have set off, well, a bit of a domestic squabble. war, of course, would be going too far. it’s more a divide of two minds, the sort played out with very few words. door clunks open ’round about seven o’clock this fair eve. in walks the one from the train. the one who knows a thing about architecture. who has something to say, and says it, most all of the time, when the subject is the look or the feel or the function of places carved into space, inside or out. why, heavens, they pay him to spout his learned opinions. so spout them he does, for pay or for free. me, i just go with my gut, and my eye. always did get along, managed just fine. um, maybe not now, though. back to the squabble, er, story. the little one, keen to impending drama perhaps, takes the tall one by the hand. “wanna see the bathroom,” he asks. “it’s covered with birds,” he happens to mention. now, mind you, before leaping into the heat here, let me back up. this bird thing comes as no surprise. it’s not as if i just opened the cage, snuck in a chirper, let loose the whole squawking flock. this had all been agreed upon. well, grudgingly maybe. but there was a green light. a nod. a certain shrug of the shoulders and with it a shake of the head in affirmative motions. yes, yes, we all know that in the world of haute architecture, wallpaper ranks just above vines. or plain old ivy, maybe it is. and we all know what ivy is in the realm of angles and planes, in the raising of walls and the shaping of rooms, houses, towers. heck, even skyscrapers. it’s the architect’s equivalent of the schmatte, the rag that’s tied ’round one’s head to hide a bad hair day. ivy goes up where architects blunder. it covers the goofs. frank lloyd wright, i believe, even said so. and somehow, it seems, paper covered with colors and prints, God forbid covered with birds nibbling berries, well, it seems it’s just as godawful as old creeping vines. maybe worse. back to the tale: so there in the nook of our stairs, where the steps take a turn, head from due east to due north, someone long, long ago, thought to tuck in a petite salle de bain. a powder room. a little spit of a joint jammed right in the corner. when we moved here, till just at the dawn of this year, it was, well, aqua–bright aqua–down on the floor, and right ’round the bend up the start of the wall. we’d never quite managed to ditch all the pool-bottom blue. and didn’t do much with anything else in the wee tiny room. until right after christmas, at the start of this year. why not leap into a recession by redoing the bath? so redo it, we did. and then came the walls. i, of course, being unschooled in these matters, had stumbled across a canadian place that sells quite lovely wall coverings. 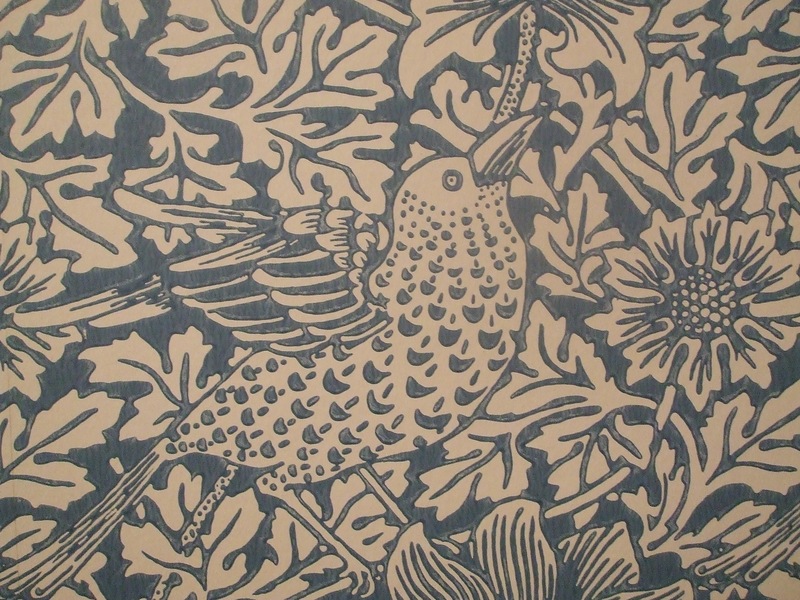 will morris wall coverings. quite a wall coverer, will. only not so if you think like an architect. which, i’ve mentioned, i don’t. but the tall one does. so, despite some willingness to back down from the plan, i did manage to leave will’s wall sample lying around, till one sunny day, when the tall one, he softened. said, oh, go ahead, it’ll be fine. so i did, and, well, it isn’t. a nice man came this morning, slathered the walls, cut strips of bird-upon-bird. i yelped i liked it so much. so did the man who slathered it on. only he’s not an architect. he’s a wall slathering sort of a fellow. he left hours before the little one took the tall one by the hand, said, here, come meet the birds. do you hate it, i called? could have cut that silence with the side of my spoon. it means to all the world that he knows of which he opines. it means to me, on occasions like this, that i’m cooked. how can i, wobbling on the mere perch of my avian affections, stand up, in any survivable way, to the weight of that see-through chunk that, if it fell on your toes, would make you yelp, ouch, in very loud howls? so far, little else has been said. but i did notice this: the bathroom door is sealed shut. i don’t think that happened by chance. i still rather like it. in fact, i like it a lot. i do think that’s a good thing. because i think from now till forever, the bathroom is mine. and so are the birds. mine, only mine. it’ll be private, all right, the cage where i and the birds now trill to our hearts’ deepest content. while outside the cage, the discontent growls like a bird-spitting cat. or is that simply the grrrr of my own personal architect? ahh, why not write to make yourself chuckle, especially when you’ve reasons to cry? i ask this night for most special prayers for a very dear friend and her 17-year-old. she’s a fireball, the girl, a junior in high school, who on monday spent hours and hours in surgery, as the doctors removed a malignant tumor from her liver. nearly the size of a football, but it’s gone now. the lymph nodes too are now gone. but they had traces of cancer, so a long saga begins. and it’s not the first for this family. already, there’s a boy we once prayed for here at the table, the little brother, who still fights leukemia, and who long ago lost a good half of his cerebrum, the front lobe of the brain. one family, four children, two cancers, one child bound to a life in a wheelchair. suddenly our worries are nothing. i look to katie, my friend, the mama above, to learn grace in action, to know what it means to walk into battle unwilling to lose. she can’t lose. God willing, she won’t. one other prayer tonight. brave jcv, whose little girl hears only with what she calls “the hearing maids,” wrote the text that became a bill that just today went before the illinois state senate’s insurance committee, in hopes that all hearing-impaired children in illinois would be afforded hearing maids of their very own. brave jcv, who doesn’t like doing so, got up and argued on behalf of her bill, said for crying out loud can we not make certain children have the means to hear birdsong, their mother’s voices, the wind rushing through trees? or words to that effect. no use keepin’ this to myself. that’d be stingy, wouldn’t it be? nope, this is for sharing. hanging up on the wall. maybe i should rent out a billboard. slap up some glue. stick it there, on the side of the road. maybe if every good soul in the world, every one that was hungry or hurting or split right in half, maybe if this swell paper heart, all zigzag and scribble and pink-upon-pink, got pulled out of all the old packs in the world, maybe then we’d not be so aching inside. only hours ago, this appeared. at the end of a day, at the end of a spell, when most all around, it was dreary, and grey-upon-grey. i didn’t hear it. but gunshots rang out, not far from here. not far from where i spent the saturday typing away. police didn’t come, though, till just yesterday. knocked down the door. brought in the s.w.a.t. team. that’s not supposed to happen. not here where the streets are cobbled in brick, and the trees, gnarled, maybe arthritic. i do think they groan, at least on blustery days, limbs centuries old, the poor hobbled trees. they’ve seen too much now, those trees. my little one doesn’t know. he’s not heard a word. blessedly, somehow, he’s been nestled right by my side. sick with a bug that’s kept him at home. away from the news trucks. away from the street where the bright yellow tape squares off the sorrow. as if it could be contained. as if, when the big yellow bus rumbles by, packed thick with schoolkids, they wouldn’t turn to look out the windows, press noses to glass. ask questions. ask lots. then he’d want to know more. want to know things i’d not want to tell him. how the man took the gun, a civil war musket, shot the boy, shot the mother. then a whole day, and 40 pages of diatribe later, he went and shot his sorry old self. i’d not want to tell that tale to my little one. or my older one, either. but he already knows. it’s hard to shake off, this sort of neighborhood news. it’s one thing when a house is knocked down, or an odd-seeming one goes up in its place. it’s one thing when a coyote is spotted, or even a cougar. but when the headline news comes from a house you pass every day. one where you walk with your mama, holding her hand, skipping along, well then, that’s a story that’s hard to take in big gulps. so you do what you can. you rock your sweet child. you rub his hot head. you squeeze honey on ice. you sing him a lullabye. all the while, of course, you are thinking of a child not too far away. a child who’s gone now. through no fault of his own. and then, there’s a knock at the door. a sweet little girl has brought home a pile of work for your child who’s sick. so you pull out the papers. and there is the heart. the heart and the hand. the red and the scribbles in blue. and that’s what he does, all right. the boy with my heart in his hand. i tucked it there long, long ago. it’s been safe ever since. 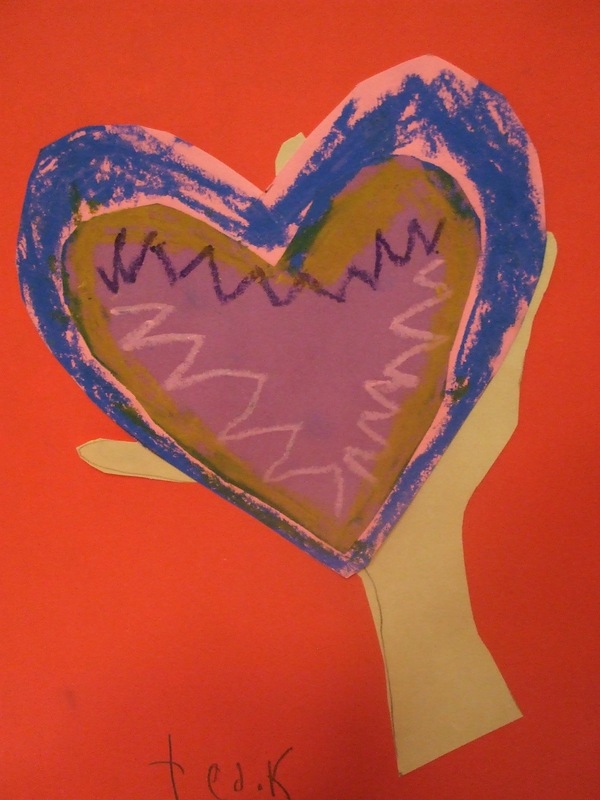 we all could use a little heart holding right in here. i know i could. this is for all of us, whoever we are, who are feeling the doldrums of winter and worry. had to jump the clock a little tonight, as tomorrow, writing wednesday, will find me far from this keyboard, typing away down in the city. the little one’s headed back to school. God willing, he’ll be kept from the shadows that fall from the very sad house, too close to the school. what’s brightened your heart in these blustery days?